Guests on-board Cruise & Maritime Voyages’ Marco Polo witnessed the skies going dark at approximately 9.40am this morning as the 2015 Solar Eclipse occurred. 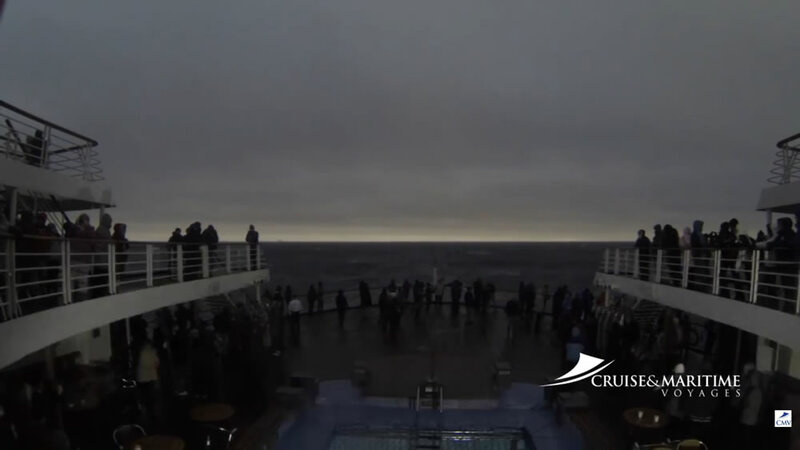 This video, filmed overlooking the aft of the cruise ship, does not show the Solar Eclipse itself but it does show the skies going dark briefly as the event took place. Several cruise ships had positioned themselves in the area around the Faroe Islands this morning as this was tipped as one of the best regions to get the best view of the phenomenon. This was the first major partial eclipse to be seen from Northern Europe since 1999 and the next one is not expected to happen until August 2026. Cruise ships in the area at the time included Saga Sapphire, Voyages of Discovery’s Voyager, and P&O Cruises’ Oriana. Fred. Olsen Cruise Lines had three ships in the area at the time – Boudicca, Braemar and Black Watch– and photos taken of the Solar Eclipse from these ships can be seen here.